I have finished March BJP - Jealously - eye word of the month. Green eyes with jealous, envy looks. The background fabric has dried leaves incorporated. Busy weekend with Mothers Day so lunch out with mum and dad and then to my sister's for dinner. We spoke to the neice and nephew so that was great. I have made a dozen coffee cup holders for presents but a friend wants to buy some so have made them earlier than for christmas presents. Finished another square on canvas 1 of walk on the wild side, so only one square to complete and that will be one canvas done. I am thrilled with getting some stitching time this weekend and have more planned out for the week. Plug for a great movie - went to the preview of Water for Elephants and this is as good as the book. I loved both. Keep safe and bless someone this week. 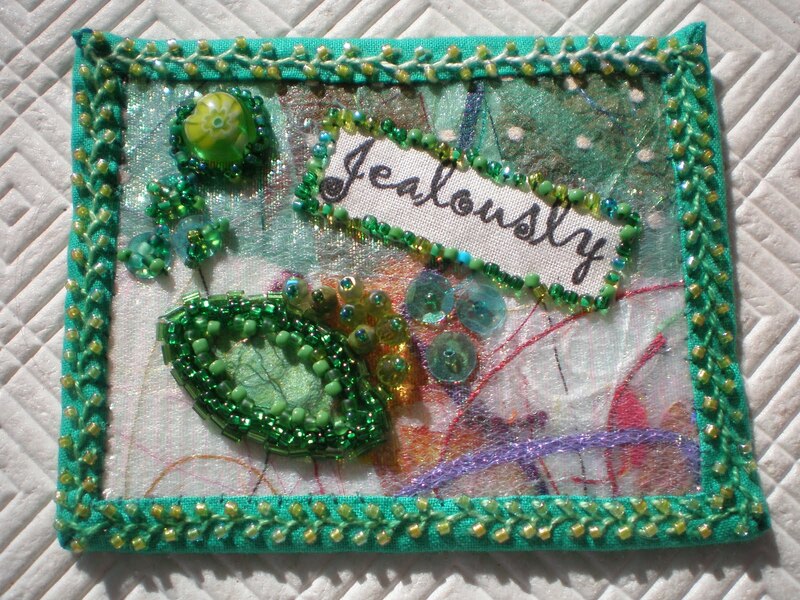 THE BJP is the Beaded Journal Project started by Robyn Atkins in 2007. it is a internet group of beaders who bead and post to highlight their life, stories, etc. 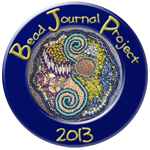 the web is http://www.beadjournalproject.com/ so you can go and check out others. I love the sparkle in this piece! Nice piece!!! Love the colors! I'm "jealous"... Yep, have to admit it... I tried during last year's BJP to find a comfortable way for me to build BJP collages, including words... It never jelled for me. I see it does for you! Bravo! Agree with 5 star review of both book and movie.